When a student leaves one class to attend another, use the Transfer link. 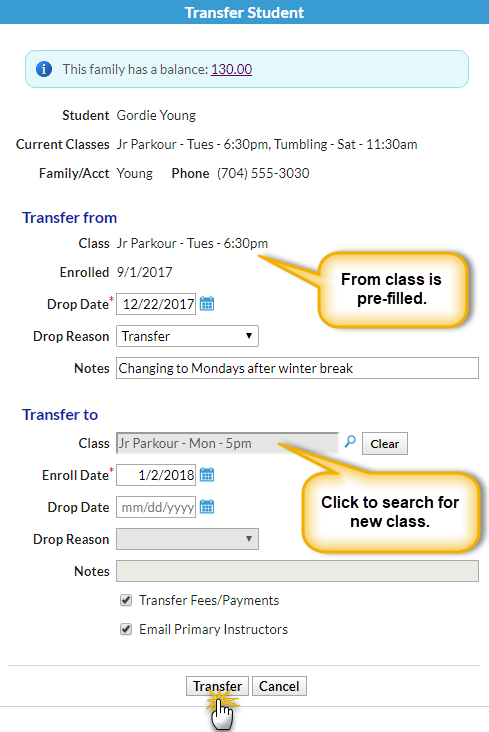 Transferring an individual student from one class to another can be completed from the Class Enroll List tab or the Student's Summary or Class tab using the Transfer link. If the family has been charged and paid for the class the student is transferring out of and the fee/payment should be transferred to the class the student is transferring into, select the Transfer Fees/Pmts checkbox. From the Student record, choose the Summary tab or the Classes tab.